As a means of interfacing audio and MIDI to your computer, Firewire has a lot going for it. It offers the single-cable approach of USB but with the speed and bandwidth to handle bi-directional, high-bit-rate multi-channel audio and busy MIDI streams that USB has only begun to match recently, with the arrival of USB 2.0. More importantly, Firewire has become quite widespread on audio interfaces and audio recording gear, and has increasingly been specified in affordable products as well as high-end ones. Yamaha realised the potential of the Apple-developed Firewire (also known as IEEE1394 or iLink) early in the game, around the turn of the millennium, and developed a technology — mLAN, or music Local Area Network — to take advantage of the interface's audio and MIDI potential. The early days of this protocol are handily summarised in a four-part SOS series that appeared between August and November 2000 (see www.soundonsound.com/search). Though slow to get going, mLAN can now be found on a range of third-party products, all of which can be easily linked via your computer, and of course, there are several pieces of mLAN-capable Yamaha gear, such as the 01X digital mixer/audio and MIDI interface/hardware control surface. 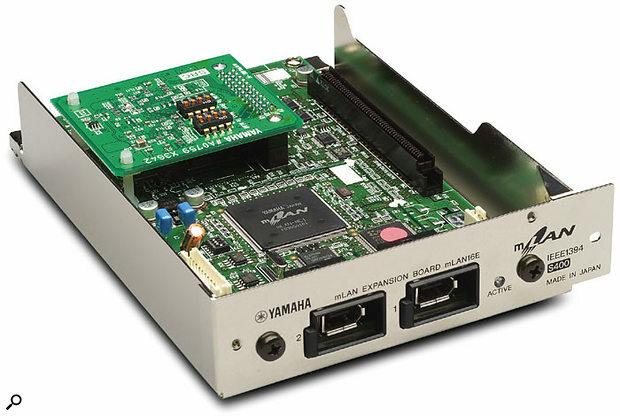 But Yamaha means synths to many people, and the company's Motif ES range was designed from the start to accommodate a user-installable mLAN card, as you can see from the box at the end of my review in SOS January 2004 (www.soundonsound.com/sos/jan04/articles/yamahamotifes.htm). While it's a shame the connectivity wasn't just built in from scratch, having the option is a major boost to an already well-specified sampling, sequencing, effects-laden synth workstation. It's that option — the mLAN16E — which is the subject of this review. As well as using it in a Motif ES (the card, of course, does nothing on its own), I also plumbed in an 01X, to see how the card and the synth it was installed in worked in the context of a larger mLAN system. The mLAN16E, which is equipped with two Firewire sockets, enables the Motif ES to become an audio and MIDI interface for your computer, and integrates the synth's hardware controller options even more closely than does its built-in USB port. Multiple MIDI 'ports' can be accessed from the computer. It's almost as if the Motif ES were one of those increasingly common 'hardware synth that also behaves as a software plug-in' instruments. The mLAN16E allows you to route audio, at 24-bit/96kHz resolution, from the ES's analogue ins to your software, and stream more audio channels from the synth's Song, Pattern and Performance modes. In the mLAN Auto Connector, you can customise exactly how many audio streams will be active for a given device in your network. The PC version also lets you select ASIO or WDM operation, the latter for software such as Cakewalk's Sonar.Up to 16 channels of audio, in stereo pairs, come from the synth to your host software, and eight channels move in the other direction. Thus, a MIDI performance can be played back on the Motif ES (either from the host sequencer or that on board the Motif) and its audio can be recorded directly to your audio software, with all monitoring via the Motif's audio outs. The synth's onboard mastering and send effects can also be used to mix process audio from software. Insert effects, sadly, cannot be accessed. Installation of the well-built card requires the removal of two panels on the synth — one on the bottom and one on the back. 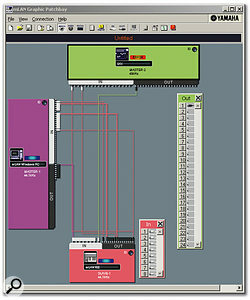 The process is straightforward, with full details in the Motif ES manual. You'll also need to go through a software installation to get the mLAN drivers and tools onto your Mac or PC (either can be used). This is really long-winded (under Windows XP at least) but fairly logical as long as you follow the instructions. Be aware, though, that there will probably be updated drivers (and firmware) on Yamaha's web site (www.mlancentral.com/drivers.php): have a look before installation. This will save you having to remove the old stuff before installing the update. It may be different for you, but the newer software offered me (and my PC-based system) several improvements, including an easy way to select between ASIO and WDM operation, and an 'auto on' option for the mLAN driver (so that mLAN starts when your computer boots up — it had to be started manually with the software version originally supplied with the card). The overall mLAN Manager hides two sub-programs. 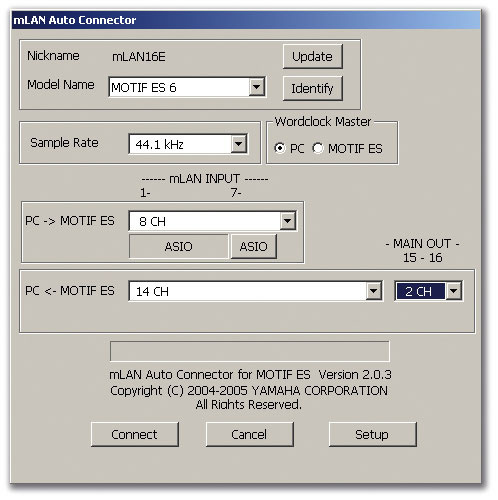 Auto Connector will be all you really need if you're simply connecting the Motif ES to a computer, and it lets you set up audio channels, word-clock routing, and sample rate, and choose between ASIO or WDM operation, if you're working with a PC. Should you have another mLAN device attached to your system, then the Graphic Patchbay utility will be invaluable. 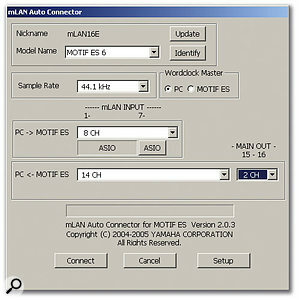 It's also simple to use, and, using a graphical interface, allows you to set up audio and MIDI routing quickly between any device on your mLAN network — a computer, an 01X and the Motif ES in the case of this review. First of all, I 'firewired up' the Motif ES and booted up Steinberg's Cubase SX. Note that the driver works with other popular software environments, including Cakewalk Sonar and Apple Logic. After a little fooling around with SX, I had MIDI communication going with the Motif ES, and Cubase audio playing from the synth's audio outs. At this stage, playing virtual instruments in Cubase from the Motif, and without any fine tuning, I was already getting a fantastically low latency, with no noticeable lags to speak of. The mLAN Graphic Patchbay lets you create links between audio and MIDI Ins and Outs with the mouse, and easily manage the Master and Slave word-clock assignments. 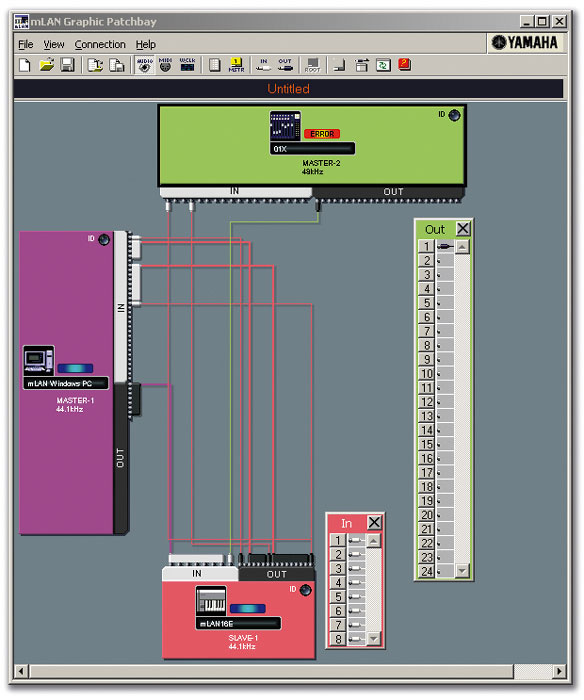 Note the colour-coded input and output windows, here for the mLAN16E (in the Motif ES) and 01X used for the review. A little more juggling was necessary to enable Motif ES audio to come into the software, and more to get audio from SX to the synth's effects. All the facts you need are in the Motif ES manual, but you may have to flip back and forth a bit to find them. In Cubase itself, there was no problem, and I was able to access as many audio in and out streams as were set up with the mLAN Manager: it was standard operating procedure to assign Motif ES audio streams to tracks and buss outputs to ES inputs. After the juggling, the Motif ES really did integrate closely with SX. I was sold on the mLAN flavour of Firewire almost immediately. As noted, there was no fussing with latency necessary and the synth did feel like an extension of the software. Adding the 01X added another layer of complexity, with manual reading once again a necessity. Be aware, for example, that you need to correctly choose the word-clock settings for both mixer and mLAN driver. Audio was routable throughout the system, allowing audio from Motif ES and/or host software to be freely sent to, and processed by, the 01X's range of EQ and effects. Nowhere did latency-induced delays become a problem, even when moving a dozen channels of audio around (just to test things out) while the Motif was playing a busy MIDI sequence and audio was being recorded into Cubase SX via the 01X. Any serious Motif ES owner working in a software environment should see the mLAN16E as an essential purchase. It might seem a little expensive, but think of the price of the average mid- to high-range plug-in software instrument. Your Motif ES almost becomes a plug-in for your software: even if you already have audio and MIDI interfacing, your overall system will benefit from a lot more flexibility, the extra MIDI and audio channels, and a seriously close relationship between your software and synth of choice. What I particularly liked was the addition of extra audio streams from the synth to the sequencer. Yamaha's AIEB2 board (which would otherwise occupy the same slot as the mLAN16E) offers a load of extra audio outs, but exploiting them fully requires what is beginning to feel like an archaic bundle of extra cabling, plus somewhere to plug in the other ends of the leads. Firewire-based mLAN does it all down one cable, letting you customise routing at the software end without any mess or physical patchbays. The same goes for routing audio to the Motif ES, as well as sending MIDI data back and forth. Some of the things you can do with mLAN wouldn't be possible without it, and those that can would again require more cabling. I might even go so far as to say that anyone shopping for a general-purpose synth to go with their software setup should check out the Motif ES first. It's a great product, as you can see from that January 2004 review, and stumping up a little extra money lets it become a more integrated part of your recording setup than practically any other similarly specified instrument. Your Motif ES becomes a part of your audio sequencing software. Adds 24-bit/96kHz audio interfacing to your computer. Installing this board means you won't be able to use the AIEB2 audio expansion option. What else is there to say? Buy one and see your Motif ES cosy up to your favourite software like never before. Yamaha-Kemble Brochure Line +44 (0)870 444 5575.